← Maybe I’m getting too old for 12 hour days! With temperatures this weekend in the high 30s and low 40s, it was an enforced “home weekend” when Bailey and I had to cancel our proposed Rocky Creek trip. 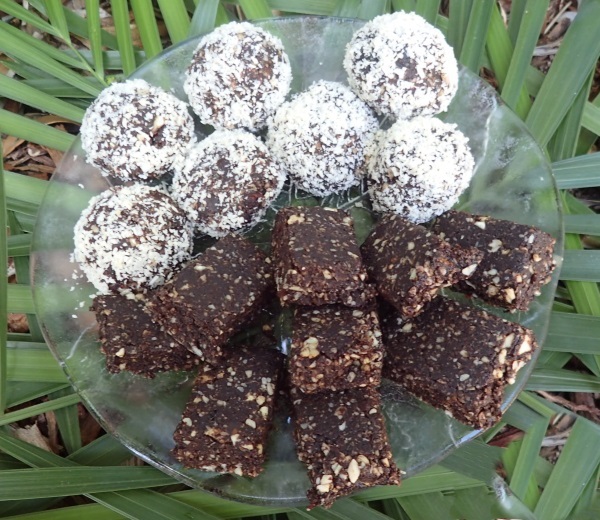 So, I thought I’d make up some recipes a bushwalking friend of mine sent me. This one got the thumbs up from my bridge partner Linda! The recipe comes from Shirley, a true legend getting out there and walking when everyone else her age has called it quits – I want to be just like her when I grow up! Whilst Linda gave it the thumbs up, she and I both agree that it isn’t as good as the green balls that I made a few months ago, but definitely one for chocoholics! 2 cups moist Medjool pitted dates, I couldn’t find these so used ordinary dates and soaked them in water for an hour. I added some Spirullina although this wasn’t in the original recipe! combine dates, cashews, almonds, cocoa powder and sea salt in a food processor. Pulse and process all the ingredients together until the texture is coarse. I had a bit of a problem with this part, my food processor is too small so I had to do it in batches, would have been better with a bigger machine. Add vanilla extract and a little water slowly until it reaches a dry but moist dough consistency. I rolled most of it out in balls (and rolled in more coconut, you can’t have too much coconut), and then rolled some out to make some bars. Not sure which I prefer but will definitely be taking some on the next trip to get me up the hills! 6 Responses to Too hot to walk or go canyoning, what’s a person to do? Fantastic! Cant wait to try this recipe. Perfect thing for a hot housebound day. When you make it up, try adding a little honey to some of the mixture and tell me if it improves the taste! I played on Saturday, where were you? It’s all about getting a balance between bridge and outdoor stuff (and family, work, friends! ), so much to do, so little time. THey look poisonous, should’ve had me round for a taste test. Just to make sure they are safe! I’ll keep some for you to try next time you visit!